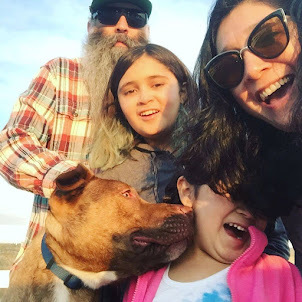 Punk Rock Parents: Homeschooling Week 13- More Multiplication, Thanksgiving Then and Now, Ecosystem Review and Poems! 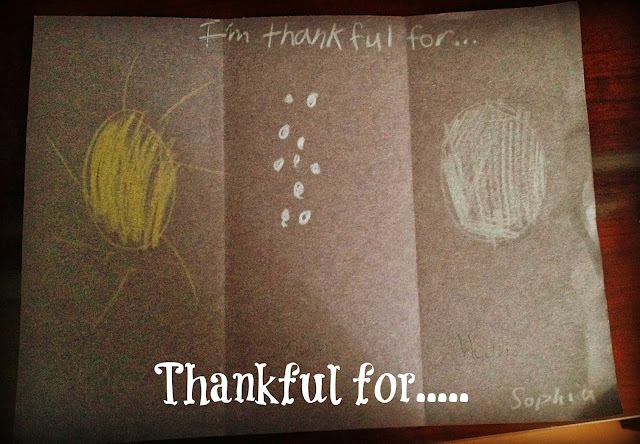 Homeschooling Week 13- More Multiplication, Thanksgiving Then and Now, Ecosystem Review and Poems! Week 13 was a little less hectic than last week. No big craft project this week. Instead we found ourselves still moving along on multiplication tables. We have been working hard up to the 5's and Phi did really good on a practice test Joey gave her. But getting her to use that memorization while working on math problems has been a struggle. The work packet we were given for the week was on the 9's and 10's and started working on order of operation. Right now the work is hard and I feel is moving a little too fast for Phi. If I next week the lessons don't slow down or time is given for review I may have to talk to the teacher. For science we are finishing up chapter 3 all about ecosystems. 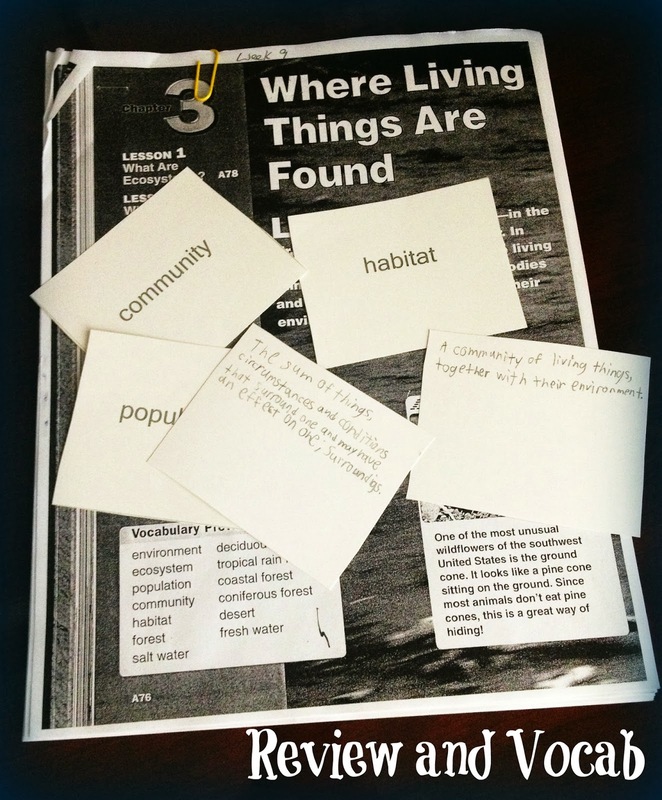 We pulled out all the handouts about the different types of ecosystem and reviewed. We made flashcards for the vocabulary words. 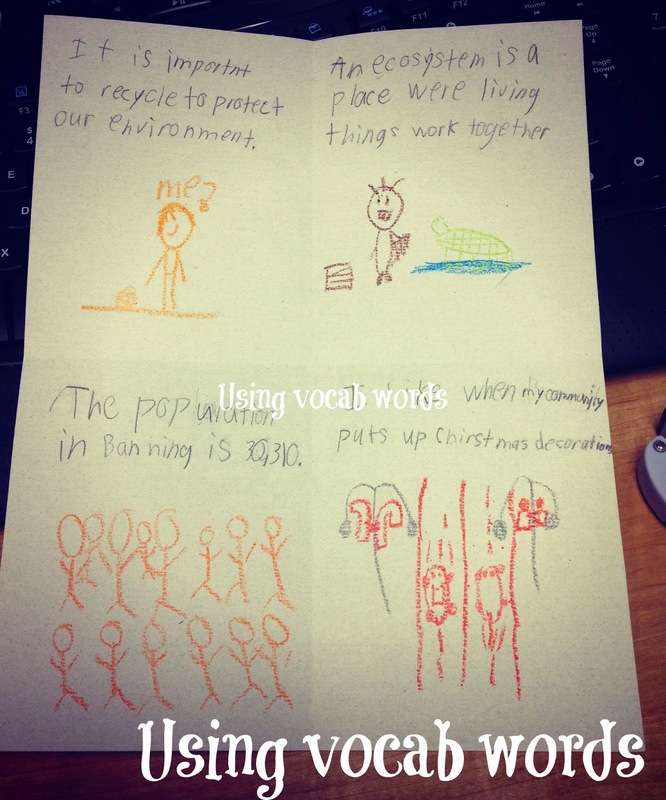 A great way we reviewed vocab was to take each word, write a sentence and make a picture to go along with it. Social Studies was all about colonies and of course Thanksgiving. 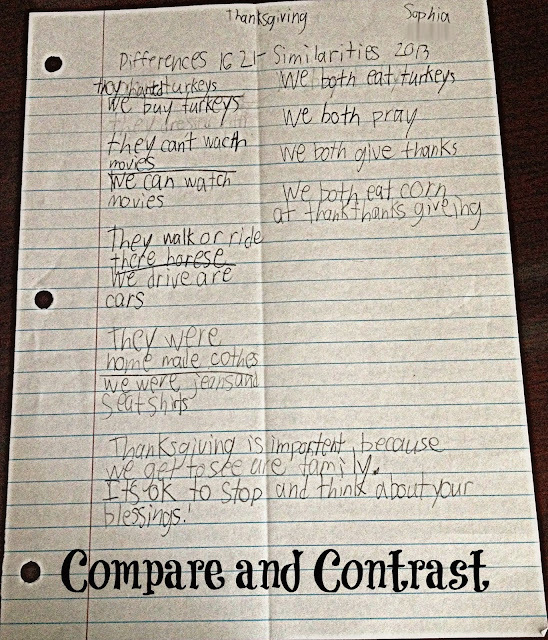 We looked at what the first Thanksgiving looked like and did a list of similarities and differences between Thanksgiving in 1621 and Thanksgiving today. For writing Phi had to write about what she was thankful for. 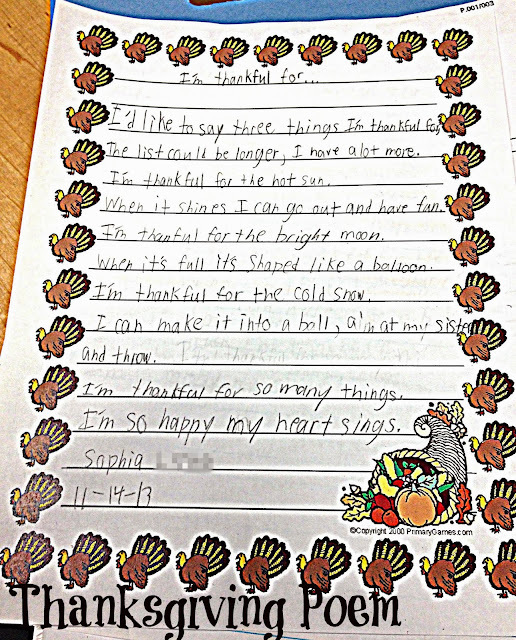 We could do this in any format and because she had so much fun with her Halloween poem, we went with poetry. She really enjoys writing and reciting her poems. She had to make a picture to go along with her poem and Phi was just not feeling creative so all I could get out of her was this. I am learning when it comes to homeschooling, just like in parenting, you have to pick your battles. We worked a little on verb tenses, spelling words and using fables and myths to help with reading comprehension to round off the week. I am curious to see what are work load will be for Week 14 since we will be off for a week for Thanksgiving! I know Sal!!!! She will get to at her dads side thanksgiving!